In a medium sized bowl, mix all of the ingredients, but the shrimp and bacon. Mix well, add the shrimp, cover and allow to marinate for 2 to 4 hours in the refrigerator. The bacon will take longer to cook then the shrimp on the grill, so we need to cook the bacon until about half way done, don't let it get crispy. How to cook bacon? Click here! 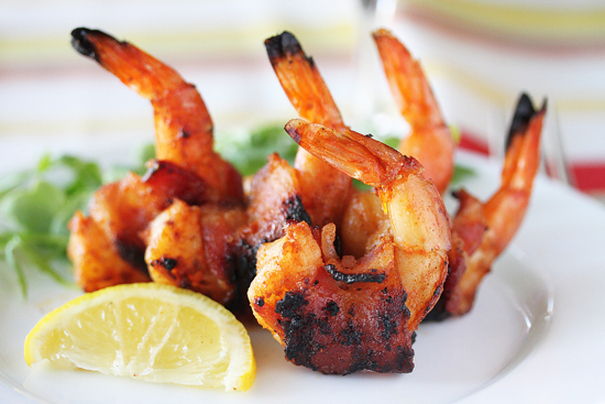 After the bacon has cooled, remove the shrimp from the refrigerator and wrap each shrimp with half a slice of bacon. Secure with one or two toothpicks or bamboo skewers. Place shrimp on a 400 degree grill and cook until bacon is done, about 10 minutes. Adjust the cooking time depending on the size of the shrimp.